Every traveller knows the thrill of falling in love with a name. Some might be stirred by the name of a city: Odessa, Buenos Aires, Timbuktu. For others it may be a route through a landscape: the Silk Road, the Via Francigena, the Camino de Santiago. For me it was the names of Europe’s great seasonal winds – the Mistral, the Tramontana, the Bora, the Meltemi, the Kosava, the Foehn, the Bise, the Sirocco, the Levanter – which I saw on a map one day, invisible pathways threading across the continent, connecting regions and cultures that seemed quite separate in my mind. They sounded like things from a fairytale, invitations to a quest. Why are some winds given names, while others remain nameless? What distinguishes one current of air molecules from another? I set out to follow four, which seemed an appropriate number for winds, drawn by the romance of their names but also intrigued by their effects; Europe’s great aeolian forces are said to influence everything from architecture to mythology to psychology. The Helm – Britain’s only named wind – blows down the western slopes of Cross Fell, the highest point of the Pennines, with enough force to destroy stone barns in the nearby Eden Valley. According to local legend the summit was formerly known as Fiends Fell, until the air-dwelling demons – whose howling caused such terror in the parishes below – were exorcised by a wandering holy man. The Helm itself takes its name from a long white cloud called the Helm Bar (a helmet for the mountain’s head) which acts as a harbinger of this freezing north-easterly. I camped for four days and nights up there, scanning the desolate moorland and waiting for the cloud to form; when it did, the demons returned to haunt me with a vengeance. My second wind was the Bora, which led me down the Adriatic coast from Trieste in north-east Italy through Slovenia and Croatia. Fierce enough to sink ships and hurl fish from the sea, the Bora is also credited with helping defeat the last major pagan army to oppose the Christianisation of Rome – turning the arrows of the troops back towards them in the air – despite the fact that it takes its name from the pagan god Boreas, ancient Greek avatar of the cold north wind. It is celebrated for bringing good health, in stark opposition to the southerly Jugo, which muddies the sky with a yellow haze (taking its name from the Slavic word for ‘south’, this is the local variant of the many-named Sirocco, whose other appellations include the Khamsin, the Ghibli, the Sharav, the Marin, the Leveche and the Xaloc). During my three-week walk I found myself in a tug-of-war between Jugo and Bora, north and south, clear skies and humid haze. At last I met my quarry on a snow-covered mountainside above the Croatian city of Split; appropriately enough for a god, Boreas froze the blood in my veins and knocked me off my feet. The etymology of the Foehn, which I chased across the Swiss Alps, perhaps also stems from the divine – it may derive from Favonius, the Roman god of the west wind – but locally it has earthier names: Schneefresser, ‘Snow-eater’, Maisvergolder, ‘Corn-goldener’, and Traubenkocher, ‘Grape-cooker’, in tribute to its warming effects. Associated with clear skies, sunshine and the coming of spring, it is also blamed for causing headaches, nosebleeds, insomnia, anxiety, depression and a host of other ailments; antique maps depict the Foehn as a puff-cheeked face blowing out not air, but showers of human skulls. I tracked this ill-omened force for a fortnight from one deep valley to another, acting on meteorological tip-offs and snatches of local lore, until eventually catching it in the heart of Haslital. After experiencing three days of relentless roaring heat – incongrously thundering from snow-capped summits and glaciers – I woke one morning so depressed that I could hardly move. It felt as if everything in my life had gone disastrously wrong, and it took me most of the day to understand the cause and effect. The legends and old wives’ tales were true: I had fallen victim to Föhnkrankheit, the notorious Foehn-sickness. As soon as I escaped that valley, the symptoms disappeared. My final wind was perhaps the best-known, being something of a household name far beyond its native range: the bitter breath of the Mistral, which blows, according to superstition, for three, five, seven or nine days southwards down the Rhone Valley from Valence to the Gulf of Lion. Its name comes from the Latin magistralis, which means ‘masterly’, and it certainly dominates the land; the farmhouses in its path are built with windowless north-facing walls to protect against its blast, and lines of closely-packed cypress trees are planted as living windbreaks from east to west. Like the Bora and the Foehn, the Mistral makes a clean sweep of the sky and helps create the vibrant light that has attracted generations of painters to the south of France. But there is a price to beauty; this ‘wind of madness’ is notorious for driving people crazy. Vincent Van Gogh, who lived in its path for two years in the town of Arles – during which time he cut off his ear and committed himself to the local asylum – referred to it in his letters as ‘a nagging malice’, ‘pestering’, ‘merciless’ and ‘the devil’, even as the conditions it brought inspired some of his greatest works. I followed its trail for ten days down an ancient pilgrims’ path on the western bank of the Rhone, ending my travels on the Plain of Crau, a little-known and desolate region classified as western Europe’s only steppe. Two thousand years ago the geographer Strabo travelled there, describing ‘an impetuous and terrible wind which displaces rocks, hurls men from their chariots, breaks their limbs and strips them of their clothes and weapons’. Apart from the chariots, nothing much has changed. 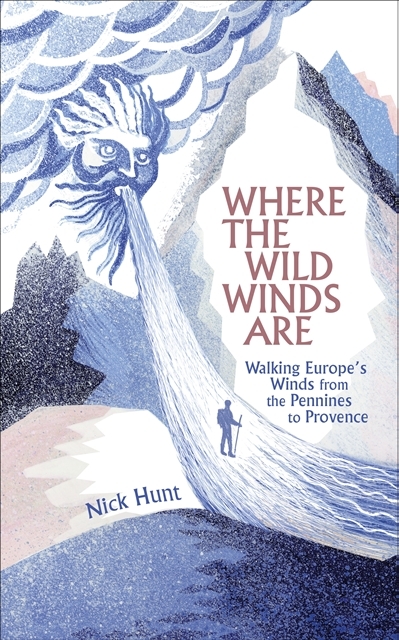 Nick Hunt’s Where the Wild Winds Are (Nicholas Brealey Publishing) was published in September 2017. Nick’s website can be found here.